ANSiscope™: Can it be the crystal ball of cardiac anesthesia? Background: Autonomic dysfunction (AD) is infrequently evaluated preoperatively despite having profound perioperative implications. The ANSiscope™ is a monitoring device that quantifies AD. This study aims to determine the potential of the device to predict hypotension following anesthetic induction, occurrence of arrhythmias, and inotrope requirement for patients undergoing off-pump coronary artery bypass surgery (OPCAB). Study Design: Prospective observational double-blinded study. Materials and Methodology: Seventy-five patients undergoing OPCAB had their autonomic function assessed by ANSiscope™. They were classified into four groups based on their AD and compared to perioperative adverse events. Results: Patients with diabetes had a higher ANSindex (P = 0.0263). They had a greater decrease in systolic blood pressure (P = 0.001) and mean arterial pressure (P = 0.004) postinduction, had an increased incidence of arrhythmias (P = 0.009), required higher inotropic support immediately (P = 0.010) and at 24 h after surgery (P = 0.018), and longer duration of postoperative ventilation (P < 0.001). They also had a higher incidence of emergency conversion of OPCAB to on-pump surgery (P = 0.009). Conclusions: An increased association between AD as quantified by the ANSiscope™ and perioperative adverse outcomes was observed. An increased rate of emergency conversion of OPCAB to on-pump surgery with higher dysfunction was noted. The authors opine that the threshold for conversion must be lower in patients deemed to be at a higher risk. Proper evaluation of the autonomic nervous system empowers the anesthesiologist to anticipate and adequately prepare for complications. Heart rate variability (HRV), reflecting sympathovagal balance, has been used as a prognostic factor in assessing cardiovascular autonomic neuropathy. Ewing's battery of clinical tests, which include heart rate response to Valsalva maneuver and deep breathing, blood pressure variation with postural change, and sustained handgrip, have been in use since the 1970s to diagnose impaired HRV. However, these tests are time-consuming and require active patient participation, and instantaneous objective quantification of autonomic dysfunction (AD) is difficult. The aim of the researchers was to determine the relationship between the AD, as quantified by the ANSiscope™, and postanesthesia hypotension, arrhythmias, and inotrope requirement following cardiac revascularization surgery. This study design was a prospective double-blinded observational clinical study. After obtaining Institutional Ethical Committee clearance, all patients scheduled to undergo elective off-pump coronary artery bypass grafting (OPCAB) at a tertiary cardiac care center were included in the study. The exclusion criteria were patient refusal, combined valve and CABG procedures, elective on-pump CABG (ONCAB), and emergency and redo procedures; patients with preoperative arrhythmias and in cardiac failure; and patients on preoperative intra-aortic balloon pump and/or inotropic support. Informed and written consent was obtained from all the patients who enrolled for the study. Demographic data, comorbid conditions, medications, and relevant preoperative investigation reports were noted. All patients received appropriate preanesthetic instructions, which included anxiolytic premedication and continuation of beta-blockers on the morning of the surgery, if any. Group 3 (Advanced dysfunction) – >51%. The anesthesiologist assigned to the patient had a minimum experience of 5 years in managing OPCAB cases. A large bore peripheral intravenous access and radial arterial line were secured under local anesthesia. The baseline systolic blood pressure (SBP), diastolic blood pressure (DBP), and mean arterial pressure (MAP) were recorded. All patients received standardized titrated doses of induction agents – midazolam 0.05 mg/kg, fentanyl 5 μg/kg, vecuronium – 0.1 mg/kg, lidocaine – 1.5 mg/kg, and propofol titrated to effect. A second reading of SBP, DBP, and MAP was obtained 3 min postinduction and before intubation. Patients were intubated with appropriate sized endotracheal tube and anesthesia was maintained with 50:50 oxygen and air. Sevoflurane was the inhalational agent of choice. Revascularization was performed by professors of cardiac surgery with a minimum of 8 years of experience in the same. A person blinded to the ANSindex obtained performed data collection. In addition to the blood pressure readings, the occurrence and nature of arrhythmias up to 48 h, conversion to on-pump surgery, and inotrope score immediately, at 24 h and at 48 h postsurgery were noted. The duration of postoperative ventilation and the development of any other complications were recorded. Statistical analysis was performed using IBM SPSS Statistics for Windows, version 22.0 (IBM Corp., Armonk, N. Y., USA). Categorical variables were analyzed using Chi-square test and continuous variables were analyzed with ANOVA test. Continuous variables were expressed as mean ± standard deviation. Student's t-test was used to compare mean values. P < 0.05 was considered statistically significant. Seventy-five patients (16 female and 59 male) satisfied the inclusion criteria and consented to participate in the study. Demographic data [Table 1]a and [Figure 2]a were comparable. Of the 75 patients, 49 (65%) had AD. Of a total of 49 patients with dysfunction, 30 (61.22%) were diabetic. There was a significant association between diabetes and AD (71.42% of diabetics had AD as compared to 57.5% in nondiabetics, P = 0.0263). Since beta-blockers can influence HRV, their effect on AD was considered. The degree of AD was found to be higher in patients not on beta-blockers (36% mean AD in those not on beta blockers vs. 27% in those on beta-blockers). Comparing the preinduction SBP, DBP, and MAP, the difference in the percentage fall in blood pressure postinduction was analyzed between the groups. 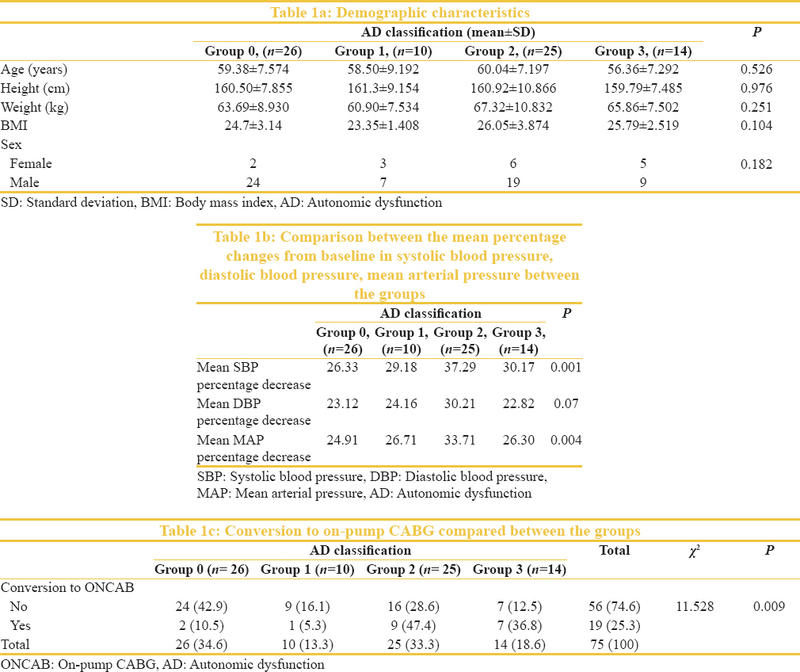 Patients with AD had a significantly greater percentage fall in SBP and MAP [Table 1]b. The greatest difference was seen in the group with late dysfunction when compared to normal patients. The incidental finding during interpretation of intraoperative data was a higher rate of conversion of OPCAB to ONCAB with greater dysfunction (P = 0.009). The overall conversion rate was 25.3%, and 22.6% cases were emergency conversions. Eighty-nine percent of the patients, who had to be converted, had AD [Table 1]c and [Figure 2]b. The inotrope requirement at immediate, 24 h, and 48 h postsurgery was analyzed. Vasoactive inotropic score was used (1* dopamine in μg/kg, 1* dobutamine μg/kg, 100* adrenaline in μg/kg, and 100* noradrenaline in μg/kg). Patients with and without AD were compared for inotrope requirement. Those with dysfunction had a significantly higher inotropic score immediate postsurgery (P = 0.01) and at 24 h postsurgery (P = 0.023). However, at 48 h, there was no difference in the score in between the groups [Table 2]a and [Table 2]b. The authors also noted the occurrence and nature of arrhythmias during the intra- and postoperative period. A total of 19 (25.3%) patients had arrhythmias. Nearly 95% of the patients who had arrhythmias had AD (P = 0.009, [Table 3]a). Ventricular arrhythmias were more frequent than atrial arrhythmias (68.42% vs. 31.57%). Patients with greater degree of AD required significantly longer duration of postoperative ventilation (P < 0.001, [Table 3]b). The major causative factors for AD in cardiac surgical patients are diabetes and myocardial ischemia.,, In the present study, thirty patients were found to have type 2 diabetes, of whom 71.42% were found to have AD. However, Ziegler et al., in their study of 1171 patients, reported a much lower incidence of dysautonomia (22.1%) in type 2 diabetics. Diabetes has known to cause CAN by inducing oxidative and nitrosative stress in the fibers innervating the heart. Persistent hyperglycemia leads to accumulation of sorbitol and alters the NAD: NADH ratio, resulting in direct injury to the nerves. Hypotension during anesthesia has been associated with worse postoperative patient outcome., One of the objectives of the researchers was to assess the ability of the ANSiscope to predict hypotension after induction of general anesthesia. Patients with late dysfunction (Group 2) had a greater percentage fall in SBP, DBP, and MAP when compared to normal patients (Group 0). The fall in SBP (P = 0.001) and MAP (P = 0.004) was statistically significant. This finding concurs with Latson et al. and Hanss et al., who demonstrated a greater incidence of hypotension after general anesthesia administration in patients with AD, using clinical tests and HRV to detect AD. ANSindex was used as a tool to predict postspinal hypotension in parturients undergoing elective lower segment cesarean section by Prashanth et al. in their study comprising 108 patients. The area under receptor operator characteristic curve for ANSindex as a solitary predictor for hypotesion was 0.737. The use of anesthetic drugs decreases the capacity to release residual catecholamines in patients with dysautonomia. A total of 19 patients developed perioperative arrhythmias, of whom 18 (94.7%) had AD (P = 0.009). Although arrhythmias of atrial origin are most common after cardiac surgery, we found a higher incidence of ventricular arrhythmias (31.57% vs. 68.42%). Chen et al. have documented an increased association between arrhythmias and sudden cardiac death due to abnormal patterns of sympathetic reinnervation. The Autonomic Tone and Reflexes After Myocardial Infarction investigators opine that recognizing the inadequacy of vagal tone empowers the treating physician to target the loss of antifibrillatory effects. The present study also demonstrates a greater degree of AD in patients not on beta-blockers (mean AD of 36%) when compared to those on beta blockers (mean AD of 27%) although it was not statistically significant (P = 0.086). 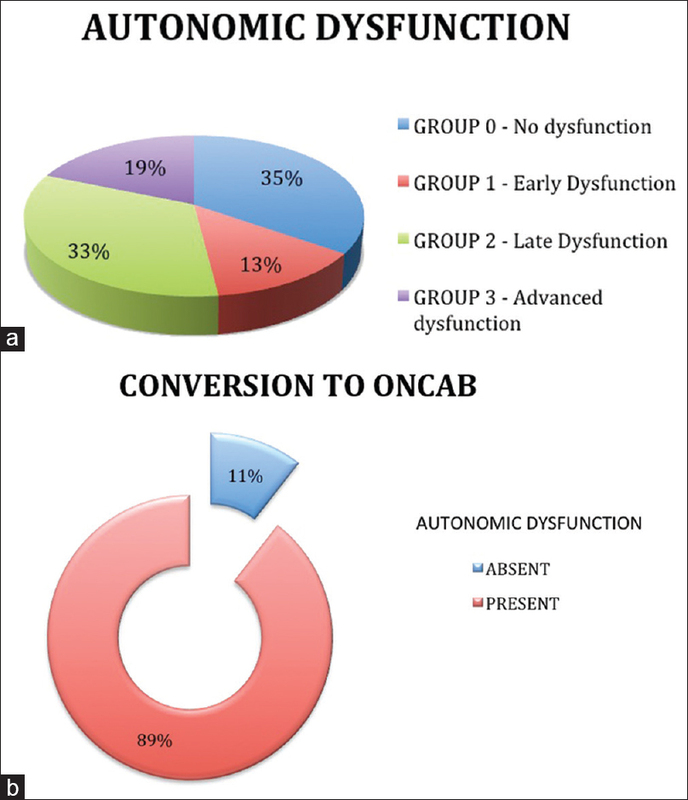 A serendipitous outcome encountered by the researchers was a significant increased rate of conversion of OPCAB to ONCAB in patients with AD (P = 0.009). The most common indication was severe hypotension during obtuse marginal grafting. Edgerton et al. in their study found that the patients who underwent an urgent–emergent conversion (in comparison with elective conversion) had a higher rate of postoperative cardiac arrest, MI, and multisystem organ failure. Lim et al. have described the 5-year survival rate to be 83.5% in the off-pump group and 73.9% in the conversion group. The CORONARY trial (Coronary artery bypass grafting Off or On Pump Revascularization Study), which studied 4718 patients undergoing CABG, also found a higher incidence of stroke, MI, renal failure, and death in emergent conversions, whereas the elective conversions were comparable with off-pump surgeries. In the current study, 89% of the patients who had to be converted were found to have AD. The overall conversion rate was 25.3%, with 22.6% of them being emergency conversions. Various studies have investigated the risk factors favoring conversion, ranging from advanced age, absence of beta blocker therapy, low ejection fraction, prior MI, cardiac failure, etc. However, there is limited literature implicating AD as a potential risk factor for conversion. 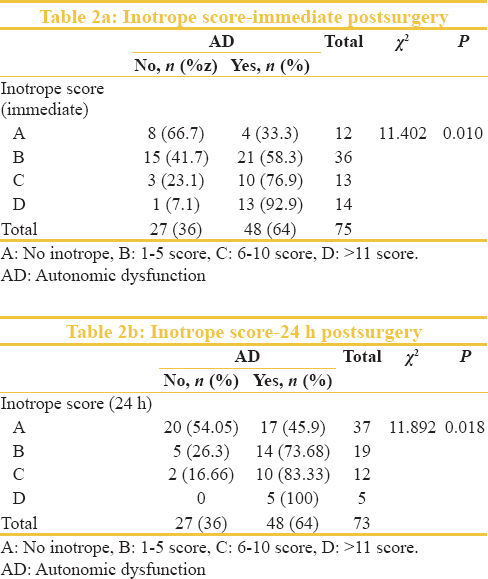 The ANSindex was used to compare the requirement of inotropes immediately, at 24, and 48 h after surgery. There was a significant higher inotrope score at immediate (P = 0.010) and at 24 h postsurgery (P = 0.018) in patients with AD, whereas there was no difference between the groups at 48 h.
Prolonged postoperative ventilation contributes to significant morbidity. Of the 75 patients studied, 2 patients had a requirement for ventilation for >48 h. Both had advanced AD (Group 3). Five patients required ventilation ranging from 20 to 48 h. All of them had either late or advanced dysfunction (Group 2/3). There was a significant prolongation of duration of ventilation in patients with AD (P < 0.001). Positive pressure ventilation decreases the venous return and cardiac output. Patients with AD who already have a maximally activated sympathetic system may be incapable of increasing their reserves to counteract the effects of positive pressure ventilation. This can account for the increased inotrope requirement and increased duration of ventilation. Increasing age has been associated with declining autonomic functions. The current therapy for AD aims at early diagnosis, regular screening and follow-up, exercise regimens, adequate glycemic control, and management of cardiovascular risk factors. Medical therapy available includes beta blockers, aldose reductase inhibitors (epalrestat and fidarestat), ACE inhibitors, prostaglandin analogs, and alpha-lipoic acid, apart from specific medication for symptoms such as erectile dysfunction and loss of bladder control. The quantification of dysfunction as provided by the ANSiscope™ was not compared with any other method to assess AD. The device cannot be used in the presence of arrhythmias. AD is commonly encountered in the perioperative cardiac setting and contributes to significant morbidity. Despite having a profound influence on the cardiovascular system, the ANS is rarely evaluated on a routine basis preoperatively. ANSiscope™ is a time efficient, easy to use, noninvasive device to quantify AD. The researchers noticed an increased association between dysfunction and diabetes, occurrence of arrhythmias, postoperative duration of ventilation, and inotrope requirement. One of the significant findings was the increased rate of emergency conversion of OPCAB to ONCAB with higher degree of dysfunction, which is again proven to be associated with higher morbidity and mortality. The authors opine that the threshold for conversion must be lower in patients deemed to be at risk. Adequate evaluation of the ANS empowers the anesthesiologist to anticipate and formulate tailor-made plans for patients as required. We thank the clinical support team of Dyansys Inc., India, for providing the ANSiscope™ to conduct the research without any additional cost to the patient. Deschamps A, Denault A, Rochon A, Cogan J, Pagé P, D'Antono B, et al. Evaluation of autonomic reserves in cardiac surgery patients. J Cardiothorac Vasc Anesth 2013;27:485-93. Curtis BM, O'Keefe JH Jr. Autonomic tone as a cardiovascular risk factor: The dangers of chronic fight or flight. Mayo Clin Proc 2002;77:45-54. Ewing DJ, Clarke BF. Diagnosis and management of diabetic autonomic neuropathy. Br Med J (Clin Res Ed) 1982;285:916-8. Prashanth A, Chakravarthy M, George A, Mayur R, Hosur R, Pargaonkar S, et al. Sympatho-vagal balance, as quantified by ANSindex, predicts post spinal hypotension and vasopressor requirement in parturients undergoing lower segmental cesarean section: A single blinded prospective observational study. J Clin Monit Comput 2017;31:805-11. Lafitte MJ, Fevre-Genoulaz M, Burger AJ. Mathematical assessment of diabetic autonomic neuropathy. Diabetes 2005;54:2307. Chen PS, Chen LS, Cao JM, Sharifi B, Karagueuzian HS, Fishbein MC, et al. Sympathetic nerve sprouting, electrical remodeling and the mechanisms of sudden cardiac death. Cardiovasc Res 2001;50:409-16. Ziegler D, Gries FA, Spüler M, Lessmann F. The epidemiology of diabetic neuropathy. Diabetic cardiovascular autonomic neuropathy multicenter study group. J Diabetes Complications 1992;6:49-57. Vinik AI, Maser RE, Mitchell BD, Freeman R. Diabetic autonomic neuropathy. Diabetes Care 2003;26:1553-79. Reich DL, Hossain S, Krol M, Baez B, Patel P, Bernstein A, et al. Predictors of hypotension after induction of general anesthesia. Anesth Analg 2005;101:622-8. Monk TG, Saini V, Weldon BC, Sigl JC. Anesthetic management and one-year mortality after non-cardiac surgery. Anesthesia and Analgesia 2005;100:4-10. Latson TW, Ashmore TH, Reinhart DJ, Klein KW, Giesecke AH. Autonomic reflex dysfunction in patients presenting for elective surgery is associated with hypotension after anesthesia induction. Anesthesiology 1994;80:326-37. Hanss R, Renner J, Ilies C, Moikow L, Buell O, Steinfath M, et al. Does heart rate variability predict hypotension and bradycardia after induction of general anaesthesia in high risk cardiovascular patients? Anaesthesia 2008;63:129-35. Mustafa HI, Fessel JP, Barwise J, Shannon JR, Raj SR, Diedrich A, et al. Dysautonomia: Perioperative implications. Anesthesiology 2012;116:205-15. Edgerton JR, Dewey TM, Magee MJ, Herbert MA, Prince SL, Jones KK, et al. Conversion in off-pump coronary artery bypass grafting: An analysis of predictors and outcomes. Ann Thorac Surg 2003;76:1138-42. Lim J, Lee WY, Ra YJ, Jeong JH, Ko HH. Analysis of risk factors for conversion from off-pump to on-pump coronary artery bypass graft. Korean J Thorac Cardiovasc Surg 2017;50:14-21. Stevens LM, Noiseux N, Avezum A, Ayapati DR, Chen X, Lucchese FA, et al. Conversion after off-pump coronary artery bypass grafting: The CORONARY trial experience. Eur J Cardiothorac Surg 2017;51:539-46. Trouillet JL, Combes A, Vaissier E, Luyt CE, Ouattara A, Pavie A, et al. Prolonged mechanical ventilation after cardiac surgery: Outcome and predictors. J Thorac Cardiovasc Surg 2009;138:948-53. Neukirchen M, Kienbaum P. Sympathetic nervous system: Evaluation and importance for clinical general anesthesia. Anesthesiology 2008;109:1113-31. Parashar R, Amir M, Pakhare A, Rathi P, Chaudhary L. Age related changes in autonomic functions. J Clin Diagn Res 2016;10:11-5. Balcıoğlu AS, Müderrisoğlu H. Diabetes and cardiac autonomic neuropathy: Clinical manifestations, cardiovascular consequences, diagnosis and treatment. World J Diabetes 2015;6:80-91.